Well, my kids have started calling me "that crazy placemat lady". Yes, I made more placemats! During a trip to JoAnn's, I saw this gray and yellow cotton fabric. As many of you know, gray is one of my favorite colors, and the yellow shapes reminded me of daffodils. I thought to myself, "What can I make with this?". Well, placemats, of course! Now, if you'll excuse me, I'm going to eat!.. followed by a trip on the treadmill! your placemats are so stylish, makes me wish I could sew! Everything looks very cute and VERY yummy! Love your flowers & pitcher! I had a big lop eared bunny named Benjamin, he and my cat traveled cross country with me when I moved from CA to NC. He was the boss of our little or not little animal family! He kept my rottweiler and dachshund in check! What a cozy little setting. Love the fabric. Love the dessert and beverage too. You know, I have become a fan of the combination of gray and yellow. I wish there was a place I could use it in my home. Nice placemats. I agree with the others...you can never have too many. I love the fabric! You are so talented...I cannot sew anything! Cute! I love the yellow/gray combo! Just made a lemon cake myself. I need a treadmill! 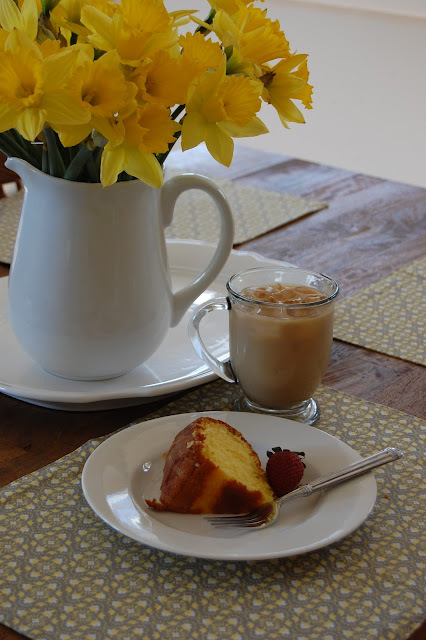 You're so cute Heather :-) Love the fabric and that lemon cake looks yummy. 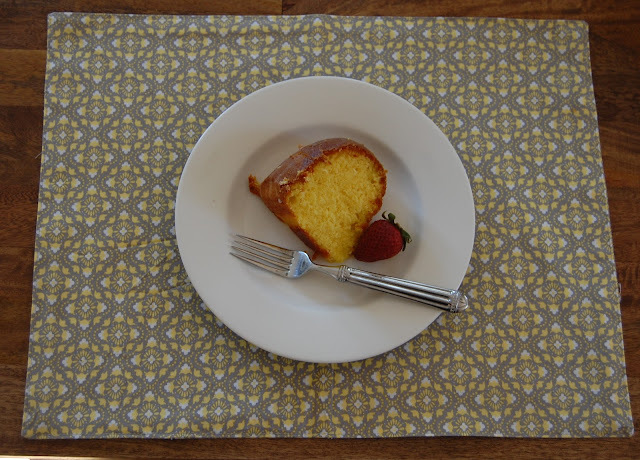 I love the placemats and I just finished eating a piece of your cake...yummy! So good. Love the color combination of yellow and gray. I think great thing about gray is you could match it with almost any color and will turn our pretty nice! Who do you think is gonna win the Celebrity Apprentice? Look very nice, i love the colour. I bet you're keeping as busy as me. It seems I don't have as much time to post anymore. Thanks for stopping by and for your sweet words about Ren's prom pictures. Ren (and her brother) are two reasons for my lack of time. haha Hope you are doing well. Love the placemats and the cake looks delicious!